Critic’s Pick: Tod, Wo Ist Dein Sieg? Colin Mawby was educated at Westminster Cathedral Choir School where his musical ability was recognized by the Cathedral Master of Music, the famous conductor George Malcolm. During his career Mawby has held the post of Organist and Choirmaster in a number of different parishes, both large and small. He was appointed Master of Music at Westminster Cathedral in 1961, a position he held until 1977. Then, in 1981, he was appointed Choral Director at Radio Telefis Eirann. 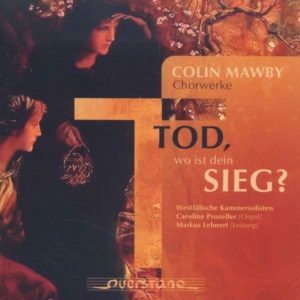 This makes Colin Mawby the right man in the right place, right at the heart of choral music! The disc contains a setting of the Latin “Requiem Mass” (written by the composer to commemorate his mother, who died when he was 3 years old), a “Missa Mundi” (based upon the plainchant ordinary – Kyrie, Sanctus, Benedictus and Agnus Dei from plainchant Mass 18 and the Gloria from plainchant Mass 15) and some motets. In the Requiem Colin Mawby has not included the “Dies Irae” and has concentrated on the vision of heaven as a peace “beyond all human understanding”. “Missa Mundi” is a strictly liturgical work. It expresses the joy of worship and underlines the manner in which Gregorian Chant can still be used as a basis for the expression of contemporary belief. The motets are quite simple and suitable for an ordinary parish choir. The texts are profound and music gives them a more immediate sense of depth and comprehension. Probably you will agree with me that “Crux Fidelis” is the best one, for the beauty of the melody and for its harmonic richness. Westfälische Kammersolisten is known for its vocal clarity and intensity. Usually the ensemble’s superb technical ability gives an unmistakable character to the sound. This is true also in this recording but sometimes they give the impression of singing like a group of soloists rather than a choir, and the blending of the sound seems to be affected by this. The Latin language suffers in some places because of faulty pronunciation. Altos and Basses are the most interesting voices of the group. The organ accompaniment is always precise and never disturbs the understanding of the text. Recommended for anyone looking for new choir music!